Autumn has truly arrived with a September chill in the air, and by this afternoon, the autumn rains had arrived in west Limerick and north Kerry. Two of us thought we would catch a walk on the beach in Ballybunion today before the rain came down. It is less than an hour’s drive from Askeaton, but by the time we arrived and parked above the cliffs the skies were grey and the rain was beginning to fall. 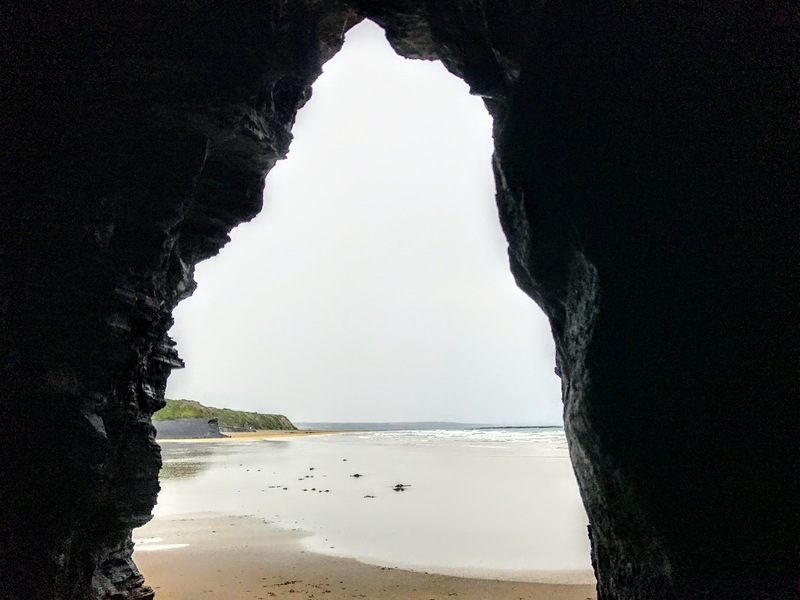 The schools have re-opened, summer is gone, and the season has come to an end in Ballybunion. Over the next few weeks, many of the cafés, shops and restaurants, as well as the caravan parks and bed-and-breakfast houses. are going to close. Some may re-open for the October bank holiday weekend, but most are not going to open again until Easter. But there was still a small number of people in Ballybunion this afternoon. A bolt from a crossbow stopped play at a cricket match between Middlesex and Surrey at the Oval earlier this week. But normally ‘Rain stopped play’ is a regular comment to cricket matches at this time of the year. However, rain was not going to deter the small number of swimmers, surfboarders and beach-walkers in Ballybunion this afternoon who decided to take advantage of the incoming tide and the rolling waves. Our enthusiasm was undampened as we explored some of the caves in the cliffs and walked along the sandy beaches, divided by the cliff top and the ruined castle. Traditionally, these are known as the ‘Men’s Beach’ and the ‘Ladies Beach,’ because in the past men swam on a separate beach from women and children. Soaked and wet, we thought the end-of-season atmosphere meant there was little chance of finding a late lunch. So it was a delight to find Lizzie’s Little Kitchen, a pop-up on the Main Street that opened two years ago. It was a surprising place to find such good food and healthy eating. We warmed ourselves up with chickpea and beetroot curry and one of the best double espressos I have tasted so far in Co Kerry. Pery Square in the Newtown Pery area of Limerick is one of the finest examples of late Georgian architecture in Limerick and Ireland. The square was named in honour of the politician Edmund Sexton Perry. The architect James Pain supervised the building, and the contractor was Pierse Creagh from Ennis, Co Clare. But, in reality, the square is only a terrace. The planned square was never completed, and the Georgian terrace is the only area of square that was finished. The remaining plots around the planned square were marked out in Davis Ducart’s plan for Newtown Pery, but they were left undeveloped. The other sides of the square now include Limerick City Gallery of Art, the People’s Park, and Saint Michael’s Church of Ireland parish church on the south side, also designed by James Pain, with Limerick’s War Memorial in the middle of the square. The terrace is the last of the great Georgian era development in Limerick, and provides a Georgian streetscape that is unrivalled outside Georgian Dublin. It is the only terrace in Limerick that is symmetrically designed, and the houses at either end have gable entrances. The terrace is known to most people in Limerick as the Tontines because it was built as a speculative development by the Pery Square Tontine Company in 1835-1838. By 1838, the houses in the terrace were let to tenants. Today, there is an elegant boutique hotel in No 1 Pery Square, and No 2 has been redeveloped in recent years by Limerick Civic Trust as a Georgian Museum. The rest of the houses have a variety of uses. But where does the name Tontine come from? The most widely-known Tontine-inspired stories include Robert Louis Stevenson’s novel The Wrong Box (1889), Agatha Christie’s 4.50 from Paddington (1957), a Miss Marple murder mystery, and Something Fishy (1957), a novel by PG Wodehouse. The Wrong Box was made into a movie by Bryan Forbes (1966), with a star-studded cast that includes John Mills, Ralph Richardson, Michael Caine, Peter Cook, Dudley Moore, Peter Sellers, Irene Handl, Nanette Newman and Tony Hancock. The word ‘tontine’ is derived from Lorenzo de Tonti, an Italian political exile living in France. He proposed the original tontine to Cardinal Mazarin in the early 1650s to help King Louis XIV raise revenue. The French treasury, depleted by the Thirty Years War and rebellions in France, needed to raise money. The idea spread to Italy, Switzerland and Britain, but Tontines in their purest form were banned in Britain under the Life Assurance Act of 1774, primarily because of the perverse incentives inherent in a product that offers benefits when others die. Although there is no known evidence that tontines inspired murder plots, they did encourage fraud. According to a recent report in The Economist, Moshe Milevsky, of the Schulich School of Business in Canada, has uncovered data that suggest parents in 17th century Britain would take out a tontine, nominate a child and if the child died, as was all too common, simply give another child the same name so as not to forgo their dividend. This led to lower-than-expected returns. Despite these legal restrictions, one of the best documented tontines in these islands is the tontine that developed this handsome terrace of six Georgian houses in Pery Square. The Limerick tontine was proposed in 1834 and the buildings were completed in 1838. The tontine company was finally fully subscribed and created in 1840. There were 89 shares and the list of subscribers printed in 1841 was headed by Edmond Pery (1758-1844), 1st Earl of Limerick. He took 18 shares, each tied to the life of a different person, ranging in age from two to 27. Ten were 10 or younger, and seven were his own children. Two of the other subscribers named essentially public ‘lives,’ the Prince Albert, then aged 22 and the Prince Consort of Queen Victoria, and 18-year-old, Princess Augusta, a daughter of the Duke of Cambridge and a granddaughter of George III. A tontine is usually brought to an end through a dissolution and distribution of assets to the living shareholders when the number of shareholders reaches an agreed small number. The long-term pay-off for the Limerick tontine was that the shareowners tied to the six last surviving lives took full ownership of one of the six houses. The shares were negotiable as long as the life related to that share continued. In 1882, 50 shares were still outstanding, held by 13 people. They shared the income of the company, primarily rents less expenses, which in 1882 came to about £225. The tontine was wound up in 1913, triggered by the death of the seventh-last of the named lives. Two of the six houses ended up with descendants of the original shareholders. Princess Augusta, one of the six surviving lives, died in 1916. As the longest-lived grandchild of George III, she was the last link to the British branch of the House of Hanover. The share register for the Pery Square Tontine includes the name of the shares’s proprietor, details of subsequent transfers of the share under administration and probate with the names and addresses of those involved and notes on the payment of dividends. For example, Share No 61 was issued to Edward Donough O’Brien, 14th Lord Inchiquin, who died in 1900, a nephew of the patriot William Smith O’Brien. Other shareholders included Daniel Barrington, Sir Mathew Barrington of Glenstal Castle, James Barry, Brabazon Connor, Hector McKern, William McKern, John Watson Mahony, James Pain, William Percy, the Hon Henry Edmond Sexton Pery, James Price the architect, James Seaword, Thomas Philip Vokes, Henry Watson, Montiford Westropp, Thomas William, George Gibbons Williams and Richard Williams. Several leases were granted to Watson in trust for the Pery Square Tontine Company. Share No 86, originally held by John Watson Mahony, was sold by his widow Sarah Jane Mahony of Farmleigh, Stillorgan, Co Dubli,n to James Nash of 85 George Street Limerick. Nash also bought out the interest of other surviving shareholders, including Sophia M. Vanderkiste. In the early 20th century, Sir Vincent Nash of Shannon View, Castletroy, sold No 3 Pery Square to Dr John F Devane, a key figure in putting Saint John’s Hospital, Limerick, on a firm footing. During World War I, Sir Vincent Nash, who was a Deputy Lieutenant for Co Limerick, leased No 4 for use by the British Army. In that recent edition, the Economist described how by the turn of the 20th century, according to a study in 1987 by two academics, Roger Ransom and Richard Sutch, as many as half of US households may have been saving for retirement through tontine insurance. But, due to fraud and mismanagement, these insurance products were banned in New York state by 1905, with other states following soon after. Despite their troubled past and negative portrayal in popular fiction, the Economist suggests tontines may just make a comeback. A small but increasingly voluble group of academics, as well as some asset managers and actuaries, think that an adapted form of tontine might be just the product to provide insurance against the risk of outliving one’s savings, an issue that retirement planners, corporations and governments around the world are struggling to cope with. Pooling lives has always been one of the most cost-effective ways to cover such longevity risk. ‘It’s what’s missing in the current DC [defined-contribution pensions] set-ups; nothing has replaced the old longevity pool which the employer used to form,’ says Chip Castille of BlackRock, an asset manager. Although annuities offer a guaranteed lifetime income, they are relatively expensive because their issuers must hold a large capital buffer. Retired people tend not to like them as they pay a low rate. Tontines are simple to understand and could be much less costly than annuities because the risks are not taken onto the balance-sheet of an insurer. Enthusiasts believe modern technology and data-crunching could help overcome the instrument’s shortcomings. Electronic records make it easier to verify whether someone is dead; crowd-funding could help source a tontine pool; and the blockchain, a type of decentralised ledger, could anonymise it, and so avert any murder plots. ‘The eventual disruption will come not from a traditional asset manager, but from a 22-year-old kid in Silicon Valley,’ Mr Milevsky told the Economist. He has seen the number of tontine-related patent applications increase recently. Tontines are a thing of the past. But they may yet come back from the grave.